Gilbane Building Company, a family-owned company since 1873, caps off the next stage of the $88 million Navy Federal Credit Union headquarters expansion. The new office building under construction at Navy Federal Credit Union’s Headquarters in Vienna, VA that is scheduled for completion by the end of 2017. Arlington, VA – December 21, 2016 – Gilbane Building Company, a national leader in construction services, is celebrating a major milestone at the site of the Navy Federal Credit Union (NFCU) Headquarters in Vienna, VA. The expansion will add 600 jobs to the 3,500 jobs already provided by the current facility. It will include a pedestrian walkway connecting the new facility and parking garage with the existing campus. The project was designed by J3 Design Collective and is scheduled for completion by the end of 2017. 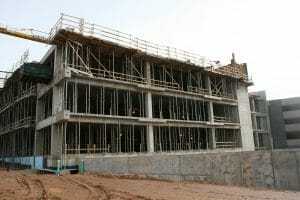 The parking structure will provide an additional 1,184 parking spaces to the NFCU campus and the office building will initially house about 600 employees, with full capacity at 1,100 people. When the office building is complete it will have an open-office floor plan and raised access floor system with the capability to re-arrange the floor and furniture layouts. This provides NFCU with flexibility based on their evolving needs. A green screen will also be installed on the open area portion of the parking garage to minimize disruptions to the residences and pedestrians along the W&OD trail. The ceremony was held at 11:30 a.m. on December 21, 2016. Participants included representatives from Navy Federal Credit Union, J3 Design Collective, Walter L. Phillips, Structural Concepts Inc., Williams Notaro Associates, Mark G. Anderson Company (MGAC) and prime contractor representatives.